Home Blog What can we learn from Leicester City’s winning reputation? On 2 May 2016, Leicester City became Premier League champions for the first time in the club’s 132-year history when Tottenham failed to beat Chelsea. This victory has sent ripples across local communities, grabbed the attention of the media and has put Leicester on the map not only nationally but also around the world. Martin’s article focuses on the reputation of the club and how it is at an all-time high at present. But he also raises some questions for the future and the sustainability of this reputation, if the club doesn’t do as well in the future. A simple idea – supporters across the world had the opportunity to wear blue to show their support for Leicester City ahead of the final three games of the season. An idea which could translate to people of all ages and backgrounds. The local media got behind a particular day near the end of the season, when the excitement about a potential win for the football club was increasing. There were wonderful scenes across the city of Leicester, from schools allowing pupils to wear blue for the day to bars serving blue coloured cocktails and butchers making blue sausages! Social media provided a key channel for supporters to share their photos through the hashtag #backingtheblues. The success of this campaign was down to a simple idea – ‘wear blue’ which anyone could do and that engaged not only supporters but also the wider community. Having a hashtag which reflects the brand but appeals to many should also be a key consideration when creating your next marketing and PR campaign. Each and every campaign, event, and marketing and PR activity you have planned, which supports the overall brand, should aim to be authentic and memorable. Every little detail can support the overall brand image. You can do this by ensuring your message and delivery is true and honest, from using real images rather than stock images to promote your company, bringing out the personality of your staff through film or the use of quotes. Really think about each marketing activity you have planned to see how you can make it the most engaging and relevant for your audience. 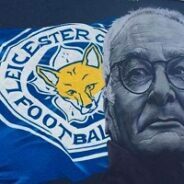 In his article, Martin cited that Claudio Ranieri was able to keep the public on his side with his ability to largely avoid football clichés and being realistic about the club’s aspirations. Leicester City’s win gave local businesses a reason to embrace change and – where possible – re-invent what they currently do. For example, Whipee Gelato, an ice cream and dessert parlour in Leicester, renamed many of its ice cream flavours after the players, which has seen their sales increase. Give people an excuse to talk about you and give partners a good opportunity or reason to tie into your campaign. For example, semiconductor company Intel successfully partners with computer and hardware manufacturers when launching their own products, maximising their exposure but also improving relationships with their sales channels. Over the next few weeks and months, and as a Leicester-based marketing, communications and PR agency, we look forward to seeing and supporting Leicester City sustain its successful reputation and the legacy around this victory.